(including short detours to churches). This is a fairly easy and leisurely route with just a few short hills, particularly at Bagwyllydiart but this short undulating section is more than rewarded by the long descent down Garway Hill. The route follows mostly quiet country lanes which are largely traffic-free. However, some earlier sections of the route follow very rough, poorly-surfaced lanes which are prone to becoming very muddy and wet in winter months and following wet weather. Hybrid bikes are recommended. Slim-wheeled road bikes are likely to struggle during the wet, winter months. 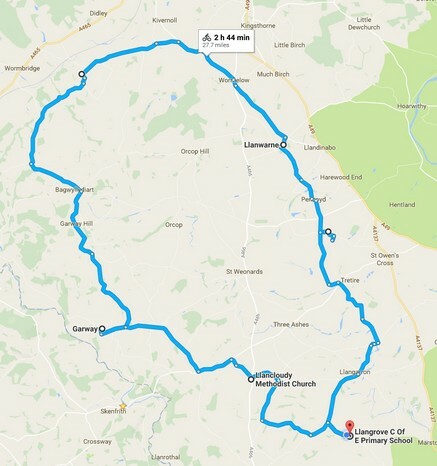 Start from Llangrove C of E Academy and follow Llangrove Road past the church on the right, Royal Arms on the left and at the T junction, turn right to Llangarron and enjoy the 1 mile gentle descent to the village and church. On reaching the village, pass the bus stop on the left and, turn left followed by almost immediate right towards Peterstow with Llangarron Church of St Deinst to your right. Pass the Langstone sign and continue towards the village. Pass Llangstone Court on the right, cross the small bridge then (2.5 miles from start) turn left into the narrow side lane before the stone house on the right. The lane follows the route of Garren brook to the left through the trees. For the next few miles from here to Tretire the lanes are rough in places and can be prone to mud in wet weather. Be prepared for some rough, muddy lanes - hybrid bikes advised. After 0.6 miles, pass Llangstone Mill on the left and continue to a small staggered crossroads of country lanes with Trehumfrey Farm on the left and continue straight ahead along the roughly-surfaced hedged lane with a metal barred gate to the right. The lane, Kilbreece Lane, crosses the Gamber, improves in condition and joins the B4521 at Tretire marking an end to muddy tracks on the route. Cross the B4521 following the sign to Tretire Church. Follow the lane to the left, passing Tretire Farm on the right and continue to the sharp right bend in the road, then follow the sign to Tretire Church up the small grass bank to the left (4.4 miles from start). Tretire church was built in 1856, enjoys fine views across the opposite meadows and a peaceful atmosphere with a former pew providing seating outdoors in the churchyard. Leave the church and turn left continuing along the lane for 1.1 miles to a small crossroads with a sign to ‘Historic Church’ to the right. Turn right and follow the lane downhill for 0.1 mile to Michaelchurch on the left. This little church is an absolute gem, dates from about 1056, has a Norman font but Roman altar with a Latin inscription stating that Beccicus dedicated the altar to the god of the cross-roads. The presence of which also suggests earlier churches were likely to have been built here. Mediaeval and later wall paintings and texts are still visible on the walls. Sadly, the church is now largely redundant and hosts just one church service per year. After visiting the church, retrace back to the small crossroads and turn right, now entering into rural south Herefordshire’s fruit-growing country at Pencoyd. Continue straight across at the next small crossroads, following the sign to Pencoyd. Pass Pencoyd Court on the left and follow the lane as it bends to the left and see Pencoyd Church of St. Denys with its 14th century tower, on the left (6.6 miles from start). Leave the church and continue along the lane which bears to the right. Cross the small crossroads, with the polytunnels to the right and continue for 0.9 miles to Llanwarne. The graceful roofless ruins of the Church of St. John, the Baptist dates from the 13th century. It was built on marshy land and coffins had to be weighted with stones to prevent them rising up through the marsh. It was abandoned in 1864 due to constant flooding from the brook, the Gamber and a newer church built opposite on higher ground. Leave Llanwarne along the lane with the church to your left and memorial to the right. The road bears to the right and meets the A466. Turn right and continue to Wormelow, then turn left opposite The Tump Inn, now joining the B4348 and newly signposted to Sustrans NCN (National Cycle Network) Route 46 (7.9 miles from start). This is a busier stretch of road leading to the small village of Much Dewchurch. Pass The Black Swan Inn, the oldest Inn in Herefordshire which still bears musket damage from the civil war on its internal timber walls, on the right. Opposite Charnwood Nursing Home on the right, turn left and double-back down the short lane to the grade I listed Norman church of St David (10.6 miles from start). Retrace from the church back to the B4348/NCN46 and continue for 0.6 miles to the turning for Kilpeck on the left. Follow the lane to the small crossroads and cross, following the sign to Kilpeck and the church at the foot of the lane (13.3 miles from start). Finely preserved Kilpeck Church, arguably Herefordshire’s finest Norman church, dates from 1140 and is noted for its original carvings inside and out and row of corbels running around the exterior of the church beneath the eaves. Continue along the lane from the church to the T junction facing The Kilpeck Inn. Turn right, following the NCN Route 46 towards Bagwyllydiart and Abergavenny. Remain on this quiet lane through Malpas to Bagwyllydiart then, 16.8 miles into the route, turn right beside the stone cottages and letterbox at Bagwyllydiart following the sign to Garway Hill for 3.3 miles. Here there are a few short but manageable inclines followed by the reward of enjoying the long 2.8 mile descent down Garway Hill with open countryside to both sides. On meeting the T junction at the foot of Garway Hill, turn right following the sign to Pontrilas. After 0.4 miles, take the first turning on the left signposted St Michael’s Church which leads down the narrow lane, joining the Four Castles Cycle Route, to the 13th century mediaeval church with its once-detached defensible tower, on the left. On leaving the church, turn right up the lane to retrace back to the main road through Garway. Turn right, pass the Garway Hill lane to the left and continue straight ahead through Garway, passing The Moon Inn on the left and Garway Common to the right and continue 2.3 miles to the crossroads at Broad Oak. Turn left towards Ross-on-Wye and Hereford on the B4521. After 0.7 miles, take the first turning on the right into the unsigned narrow lane with the detached house and farm buildings on the left. The lane descends gently, bending to the left passing Moor Farm on the right then Meredith Barns on the right following a short climb. At the T junction in 0.3 miles, is Llancloudy’s Methodist Chapel on the right, a small white building on the corner of the junction erected in 1810 by Joseph Mendmore according to its wall plaque. Turn left then immediate right. The lane falls then climbs steeply for a short distance then reaches a small unsigned T junction in 0.7 miles. Turn right passing the Cattery and Penblaith Barn (0.8 miles) on the right and take the small farm track on the left, marked by a footpath sign. This isn’t a main road and could be easily missed so look for the footpath sign pointing along a concrete track which soon becomes unsurfaced, followed by another roughly-surfaced concreted section. The track bears to the right through Treworgan Farm and emerges on the Llangarron-Welsh Newton lane. With the pond on the left and short terrace of cottages to the right, turn left and follow the lane up to the turning to the right to Llangrove. Turn right, retracing the outward section of this route, pass the Royal Arms on right and return to Llangrove C of E Academy to complete the ride. © K Wren 2017. All rights reserved. Map is for illustrative purposes.